It’s been a little while since I posted. That’s because in the past month I’ve been spending some really focused time working on my upcoming book. It’s taking longer than I anticipated, and is certainly providing lots of opportunities to learn along the way. (Click here to learn more about my book). Today I’m back in the office after an enjoyable couple of weeks away in Western Australia with my husband and son. It was wonderful to be able to spend time visiting family and friends, relaxing with diverse travel and leisure activities. It provided a great break away from my book writing , and other regular habits and activities. Visiting different places and doing different activities, can be a great way to reinvigorate the mind, body and spirit. It shifts your focus away from habits and towards the unfamiliar. In doing so it creates space for freshening up your perspective. Whether an art piece is weird or wonderful, good or bad or not, is in the eye of the beholder. Each piece offers the observer the opportunity to interpret the art themselves. How we judge the art is based on our own internal measuring sticks, the library of references in our mind. This library is created through our own memories, experiences and emotions, and what we have learned from others. The mind uses it to filter the information we see, hear and feel. It shapes the way we think, feel and act, and therefore our results. When you’re dissatisfied with your results, it’s a sign that you need to tweak your library of references and change what’s limiting you. A holiday is a great way to start the process of tweaking your references. 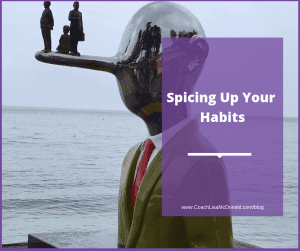 But you will likely need to do other work to identify these references in order to retrain your mind and body by implementing different habits. With persistence and consistency, your results should begin to change. If not, further work may be required to achieve success. 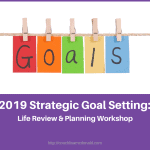 Do you have an important decision to make or goal to achieve? 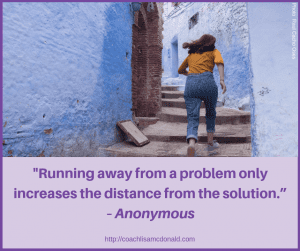 If you’d like some help to shift your perspective and habits so you can achieve different results, I’d love to help you. You can find out more by clicking here: to book a chat with me. Christmas is one of the most celebrated holidays in the world. It can touch many people, from children through to adults, throughout the years. Consequently it can be the source of many memories. Each story of an event is affected by the way you see, think and feel about about what happened. For some the memories are happy and positive, while for others they are unpleasant or painful. Whatever you experience in life, you have the ability to shape your own story. 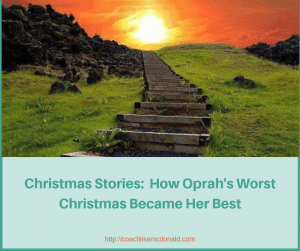 In today’s post, I share Oprah Winfrey’s story about how her worst Christmas became her best. And, some of the ways in which that story affected her. It was Christmas Eve and Oprah was 12 years old. Her mother took her aside and told her that they wouldn’t be having Christmas that year. Oprah’s initial response was to asked about Santa. Her mother responded by telling her that there was not Santa. There wasn’t going to be any gifts for her or her young sisters. In truth, Oprah had already started to become aware that there was no Santa. However, this was her first realisation that they were poor. Her initial reaction was of guilt and shame. Then, she began thinking about the story she would share with others. Normally on Christmas morning all the kids would play out doors with their new toys, and show their neighbours what they had received. Knowing that she wouldn’t have any new toys to show, Oprah considered whether she would hide out in their house or say she was sick the next morning. It was going to be her worst Christmas ever. Late that night, some nuns came to the house with food, and toys for her and her young sisters. Oprah was very touched and grateful – someone had noticed them! Additionally, this wonderful act of kindness had gifted her with a new story to tell. Oprah had recognised that it transformed her story, from her worst Christmas into her best . Oprah never forgot that earlier experience and how she felt. Years later she was building a house which was not going to be ready for Christmas. She asked herself, “what would be the next best way to spend Christmas?” She reflected back on her childhood experience. The answer that came to her was to give other children that same experience, of being noticed. She decided to go to South Africa and to give food, clothes, toys, and soccer balls to some of the poorer villages. Oprah re-framed her story, which enabled her to experience the joy of giving to these kids. If your life has been touched by Christmas then it is likely that you have your own stories to share. Aside from Christmas (which many people in the world don’t celebrate), your life has been impacted by many things. Take a few minutes now to reflect on some of your best and worst stories from your life, and how they have impacted you. What experiences you are grateful for? Do you have any stories that you need to transform into more positive and empowering ones? How could you share that same experience with someone else? As a 12 year old, Oprah had a powerful experience. She could have chosen to focus on negative aspects of her story, or she could focus on the positive aspects of her story. By choosing to focus on the positive, she got to feel grateful and empowered. You have choices too. Whether you celebrate Christmas or not, your experiences can be powerful. Your stories of these events are flavoured by how you think and feel. Consequently your stories shape your life. They also have a ripple effect, flowing on and impacting others. Carrying around negative stories increases stress and conflict. It also reduces your self-belief, drains your energy and keeps you stuck in the past. 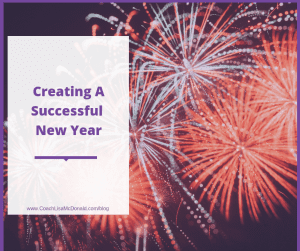 Instead, learn how to re-frame your stories into more positive ones. 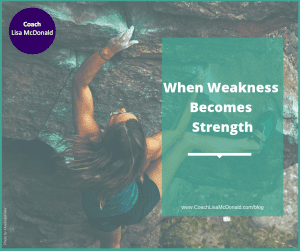 If you’re finding it difficult to re-frame your story, and would like some help, please click here to book in a free chat with me. Remember, your stories and choices shape your life. 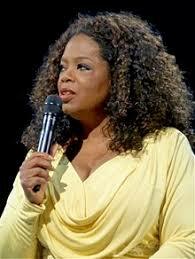 Just like Oprah Winfrey, you can re-frame your stories to support you and the life you want to live.